Supervisors can now access the monitoring tool not only from the main menu in Agent Console, but also from an easy-to-access Monitoring tab next to Customers, Tasks, and Cases tab. Monitoring allows supervisors to review and actively monitor agents, queues, groups, and campaigns. Log in to Agent Console. 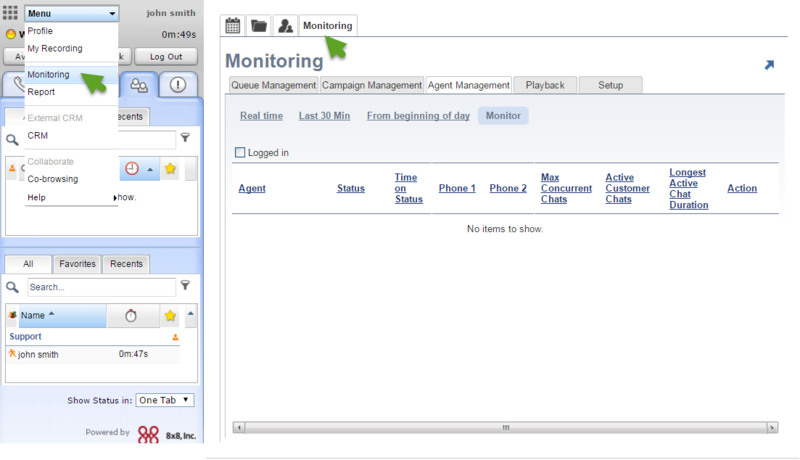 If configured by your administrator, the Monitoring tab appears along with other Local CRM tabs. You can also access the Monitoring tool via the main menu. As an administrator, you can enable the Monitoring tab for supervisors. You must log into Configuration Manager and enable this option for each supervisor individually. Log in to Configuration Manager. Find the desired agent and click Edit. Open CRM & Tab permissions. Select the Monitoring check box. The next time the supervisor logs in to Agent Console, they see the Monitoring tab. Note: By default, the Monitoring tab is added as the last tab in Agent Console. You can change the order of display by dragging and dropping it in a new location. You can change the order of tabs in Agent Console as you prefer, to optimize efficiency and convenience. In Configuration Manager, go to Agents. Select a row and drag to the desired location. The order of tabs takes effect next time the agent logs in to Agent Console. Supervisors can open the monitoring window in a separate pop-up window. Click the arrow on top-right corner of the Agent Console Monitoring window for the pop-up window to open. 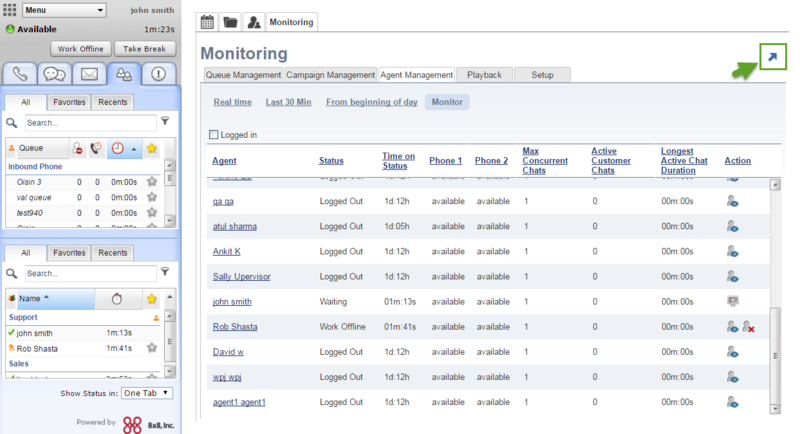 To go back to the Monitoring window inside the Agent Console, click the arrow again. The monitoring data is updated even when the supervisor is on Break status. The last monitoring configuration before the supervisor logs out is saved, and is presented when they log back in.